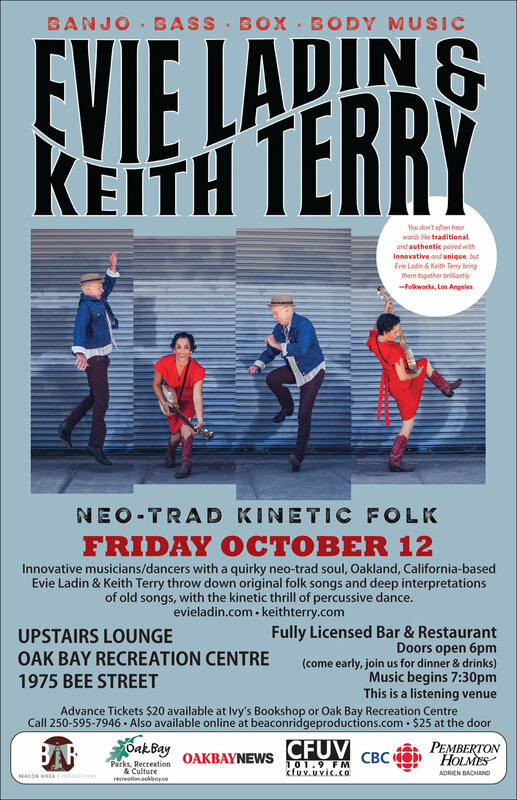 Innovative musicians/dancers with a quirky neo-trad soul, Oakland, California-based Evie Ladin & Keith Terry throw down original folk songs and deep interpretations of old songs, with the kinetic thrill of percussive dance. Ladin sings and plays infectious clawhammer banjo, while Terry is a master percussionist. It is Appalachian string band music pared to the absolute minimum of accompaniment, but packed with an orchestra’s worth of rhythm. 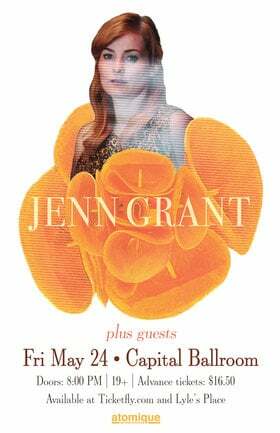 A prolific singer-songwriter, percussive dancer and square dance caller, the polyrhythmic heat of Evie’s clawhammer banjo has been heard from A Prairie Home Companion to Celtic Connections, Lincoln Center to Hardly Strictly Bluegrass. She can write, she can sing, and she pulls back from the saccharine brink with wit – a sharp intelligence. Trained as a jazz drummer, Keith Terry brings tonal percussion to stand-up bass, is a renowned percussionist/rhythm dancer, the founder of the International Body Music Festival, and a collaborator with a host of inventive performers from Bobby McFerrin, Tex Williams and Robin Williams, to Turtle Island Quartet, Charles “Honi” Coles and Bill Irwin. 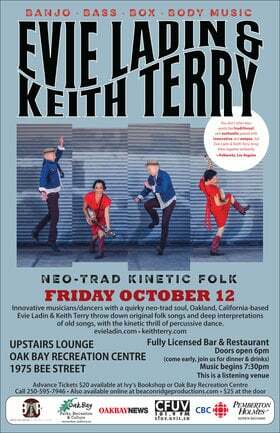 Keith in action is like visiting an anatomical carnival, where hands, feet, fingers, engage in a musical ballet!